Add to that, the one-horned rhinoceros, the oldest refinery in India, a people made all the more colourful by a sizeable population of tribals and one of the most venerated Sakti temples in the Country , and you know it is Assam --- the land of the Red River, the Brahmaputra, and the Blue Hills flanking it. 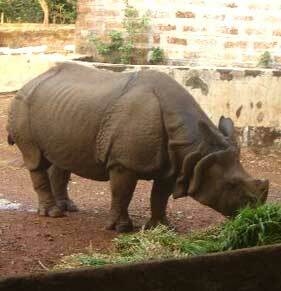 Famed inhabitant of the Kaziranga National Park: The one-horned rhinoceros. For Assam is identified no better than by its Bihu songs and dances, the Kaziranga Wild Life Sanctuary where the rare one-horned rhinoceros roams at will, silks such as paat and muga which rank amongst the finest in the world, the State's tea which finds its way to millions of homes all over the globe, and the Shrine of Kamakhya which draws thousands of devotees every year. Assam's history goes back to ancient times. The base of this history can be found in Tantric literature, Buddhist literature, Assamese folklore and Vedic literature. However, first mention of the state of Assam is found in the epics and the religious legends. The Aryans belonging to the priestly and warrior classes found their way into Assam in very early times. Various places mentioned in the epics, like Mahabharata etc. are now identified with sites in this state. 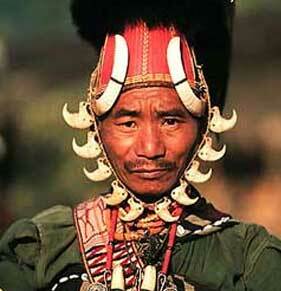 The people of Assam have traditionally been craftsmen from time immemorial. Though Assam is mostly known for its exquisite silks and the bamboo and cane products, several other crafts are also made here. 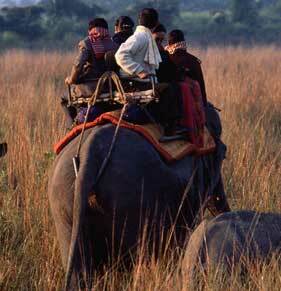 Kaziranga National Park, The first and the oldest National Park in Assam situated in Golaghat District, is a World Heritage site. Spread over an area of 430 sq. 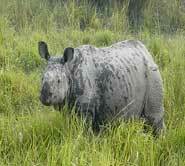 kms., Kaziranga National Park is the natural home of the one-horned Indian rhinoceros. 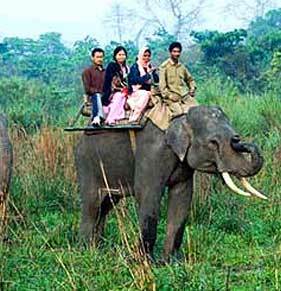 Declared a National Park in 1974 the landscape of Kaziranga is of sheer forest, tall elephant grass, rugged reeds, marshes and shallow pools. One of the world's largest rivers, the Brahmaputra and it's tributaries flow through the state offering a wide network of rivers for various water sports. 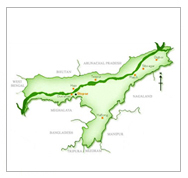 Angling, the river Jia Bhoroli, Kapili and Manas are the best places for angling. The Jia Bhoroli river is home to the fierce game fish, the Golden Mahseer, or tiger of the Himalayan rivers. Bell-metal and brass have been the most commonly used metals for the Assamese artisan. Traditional utensils and fancy artiicles designed by these artisans are found in every Assamese household. The Xorai and bota have in use for centuries, to offer betel-nut and paan while welcoming distinguished guests. 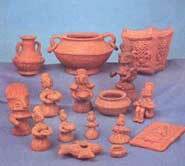 The toys of Assam have been broadly classified clay toys, pith, wooden and bamboo toys, and cloth and cloth-and-mud toys. While the human figure, especially dolls, brides and grooms, is the most common theme of all kinds of toys, a variety of animals forms have also dominated the clay-toys scene of Assam. Pottery is probably as old as human civilisation itself. in Assam, pottery can be traced back to many centuries.The Kumars and Hiras are two traditional potter communities of Assam and while the Kumars use the wheel to produce his pots, the Hiras are probably the only potters in the world who do not use the wheel at all. 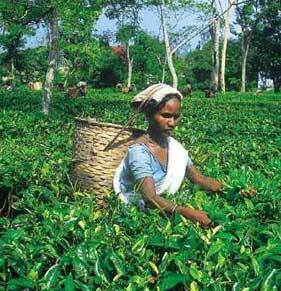 Assam has always remained one of the most forest-covered states of the country, and the variety of wood and timber available here have formed a part of the people's culture and ecomony. An Assamese can identify the timber by touching it even in darkness, and can produce a series of items from it. With tribal art and folk elements form the base of Assamese culture, masks have found an important place in the cultural activities of the people. Masks have been widely used in folk theatres and bhaonas with the materials ranging from terracotta to pith to metal, bamboo and wood. Gold has always constituted the most-used metal for jewellery in Assam, while the use of silver and other metals too have been there for centuries. Gold was locally available, flowing down several Himalayan rivers, of which Subansiri is the most important. There will be a lot of scopes to fit yourself as a part of this festival . Special events are being organized during the festivals days round the clock. Cultural programmes will continue with the participation of various traditional and classical cultural troupes of Assam and troupes from rest of the country, in addition to rich cultural heritage of Majuli. The Assam Boat Racing & Rowing Association, Guwahati organizes Brahmaputra Beach Festival on sandy beach of the mighty river Brahmaputra. Celebrated every year in Jorhat, this festival is all about tea, music and merriment. A world of festivity with traditional hospitality, jungle safaris, tea garden visits, golf, local cuisine, rafting in turbulent rivers. Come April, and for the numerous communities, tribes and sub-tribes inhabiting the banks of the mighty Brahmaputra it's time to welcome the onset of the agricultural season, a celebration of the vibrant springtime fertility cult. 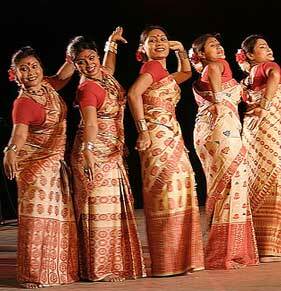 Bihu is the most important festival of Assam. 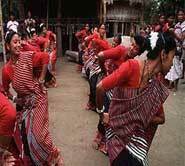 It is celebrated with joy and abundance by all Assamese people irrespective of caste, creed, religion, faith and belief. This spectacular fair(mela) is held every year during winter at Jonbeel of Jagiroad, a lesser known township only 32 kms from Guwahati. A few days before the mela, tribes like the Tiwas, Karbis, Khasis, Jaintias from the Meghalaya hills come down with their various products for this mela. This is the most fascinating spring festival of the Deoris of Assam, one of the four divisions of the Chutiyas, who are believed to have been members of the great Boro race. The term 'Bishu' might have originated from the Chutiya word 'Bishu'. 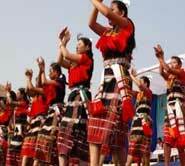 The annual festival of the colourful Dimasa tribe. It is exclusively a socio-religious festival which is generally observed before starting a new cultivation. Rajini Gabra is celebrated during day time. 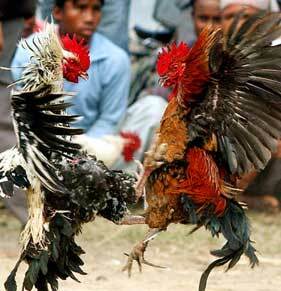 Rongker and Chomangkan are the two most important festivals of the Karbis, an indeginous tribe of Karbi Anglong. 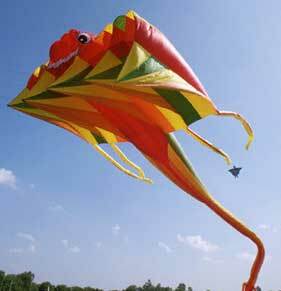 Rongker is basically a springtime festival of merriment and is performed at the beginning of the New year. 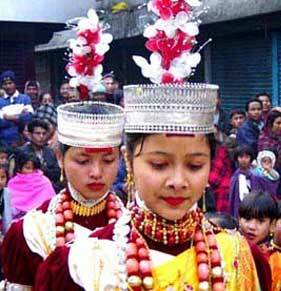 Ali-Ai-Ligang, the spring festival of the Mishing Tribe is the most colourful festival held every year on the first Wednesday (Ligange lange) of the month of 'Ginmur Polo' (February-March). 'Ali' means root, seed; 'Ai' means fruit and 'Ligang' means sow.